AIRBUS IS TO OFFER FLIERS THE CHANCE TO CATCH SOME MILE-HIGH SLEEP BY FITTING SLEEPING BERTHS IN ITS AIRLINERS’ CARGO DECKS. The pan-European planemaker is working with cabin equipment manufacturer Zodiac to develop modules containing beds that slot into the cargo spaces below the main deck of its aircraft. The companies say the products will be interchangeable with regular cargo containers, meaning they can be swapped out when not in demand with the space being used to carry freight instead. Modules will be designed to fit into aircraft using the current runners and wheels system that is used to hold cargo pallets, meaning aircraft will not have to be reconfigured to hold them. Airbus and Zodiac believe this means they could be loaded into the lower deck of an aircraft within the normal turnaround time it takes to refuel, clean and load a plane. The companies hope to offer the sleeping modules as an option on its aircraft – initially the A330 widebody airliner – from 2020. Early concept designs are not just limited to holding beds, with other options including family and meeting rooms, as well as medical facilities. The design is based on Airbus’s experience of creating rest areas for pilots and cabin crew on long flights that are tucked away below the main deck of the aircraft. Zodiac said the sleeping modules would allow airlines to differentiate themselves from rivals in a highly competitive market. For example, when Etihad introduced “Apartment” cabins featuring a leather chair and 6ft 10in bed on first-class flights, Emirates rushed to deliver a similar offering, with its “Residence” described as a “three-room penthouse in the sky” complete with shower. Singapore Airlines has since brought in a similar service. Whether airlines will actually get on board with the idea remains to be seen. 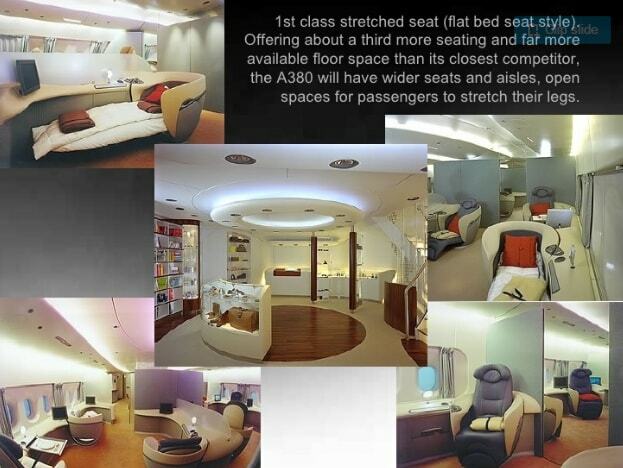 Airbus initially promoted its double-deck A380 “superjumbo” with interior concepts including inflight shopping malls, cinemas and gyms. In practice airlines opted to cram more seats into the giant aircraft and offer more luxurious business and first-class services.